When you have a broody hen sitting on eggs that will never hatch (i.e. you don't have a rooster, or don't want more chicks so you're collecting all the eggs daily) it's best to break her of her broodiness - for her own good as well as for the good of the flock. If she's not sitting on eggs that will hatch, your broody will never get the 'signal' to snap out of her broodiness. Chickens don't just sit for 21 days (the length of the incubation period) and then automatically stop sitting. Instead, it's hearing the peeping of chicks that breaks the broodiness. Without those chicks hatching, a broody won't get the signal and some will sit almost indefinitely, possibly leading to serious health concerns. While some say that it's fine to let a hen sit on a nest indefinitely, or sit without actually actively incubating fertile eggs, I disagree. I don't think the toll that brooding takes on her body is worth the risk unless the outcome will be baby chicks. 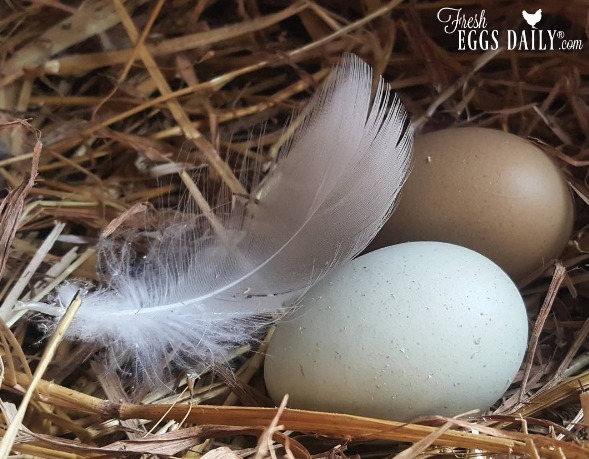 So here are my nine reasons to break a broody hen - and some "fresh" tips to help a broody who IS sitting on fertile eggs to get through the incubation period more easily. A broody hen will only get off her nest for short periods of time - and only several times a day - to eat, drink and relieve herself. As a result, she will likely eat only a fraction of what she would normally eat (I've read she might only eat about 20% of her regular intake) meaning she will quickly lose body mass. If she loses enough weight, she can actually die of malnutrition. Reduced water intake is also a concern for broody hens. Dehydration, especially in the warmer months, can lead to death fairly quickly. Fresh Tip: If you are hatching chicks under a broody, putting both feed and water close to your broody's nest is beneficial. Since a broody hen is sitting on the nest for hours on end, she's not stretching her legs or getting enough exercise. That can lead to circulation problems. Fresh Tip: If you're hatching under a broody hen, tossing some fresh herbs into her nest for her to nibble on to help with her circulation can be beneficial. Good ones include basil, hyssop, lavender, marigold and rosemary. Not getting outside much also means your broody hen isn't getting access to fresh air and sunshine like she normally would. Fresh Tip: Be sure to leave your coop windows open during the day for ventilation and good air flow. Since most broody's hormones kick in during the spring and summertime, there's a good chance she'll be sitting in a pretty warm coop. Depending on how warm it is when your broody decides to sit, it can get extremely hot in the coop during the day - and especially within the confines of the nesting box your broody is in. Heat exhaustion is a very real thing in the chicken world - and can quickly lead to death. Know the signs and be ready to offer electrolytes or a tub of cool water to stand in. Fresh Tip: Consider moving your broody and her nest to a small cage or crate on the floor of your coop where it will be cooler. I like to put a wooden box on its side inside a dog crate so my broody still feels like she has some privacy. Moving a broody is only recommended early in the incubation period, since it can sometimes throw a broody of sitting. A broody hen generally won't be dust bathing, which can lead her at a greater risk of contracting mites or lice or other external parasites. Since the area under her is dark, warm and humid, it's a perfect breeding ground for these creepy crawlies and others that can lead to anemia, and even death in worst case scenarios, and be an annoyance at a minimum. Fresh Tip: Tossing some fresh or dried herbs into the nest that have insect-repelling properties can help repel parasites. Good choices are bay leaves, cat mint, lavender, lemon balm, marigold, mint, rosemary and thyme. Also sprinkling some DE (diatomaceous earth) into the nesting box will work to kill mites without posing a risk to your broody or her chicks. A broody hen will stop laying eggs, so if she's not actively hatching chicks, you want to get her broken and back to laying as soon as possible. The longer she sits, the longer it will be before she resumes laying again, so speed is of the essence. If she has only been broody for a day or so, she should get back to laying in a week, but the longer her broodiness drags on, the longer it will be before you see eggs from her. Fresh Tip: Try encouraging one of your older hens to sit on eggs for you. She's likely not such a good layer anymore anyway, so you won't be missing out on eggs by taking her out of the so-called 'production line'. It's thought that broodiness is 'contagious' to some extent, meaning that once one hen has gone broody, other hens' hormones seem to react and signal them to go broody as well. So while you might not mind one hen sitting on an empty nest and not laying eggs for you, how would you feel about 3 or 4 broody hens - all at the same time? Fresh Tip: If you do have several broodies at once, and only want one to sit, consider moving the one you've chosen away from the rest so they won't be tempted to join her! I have a small coop that I sometimes use as a 'nursery'. 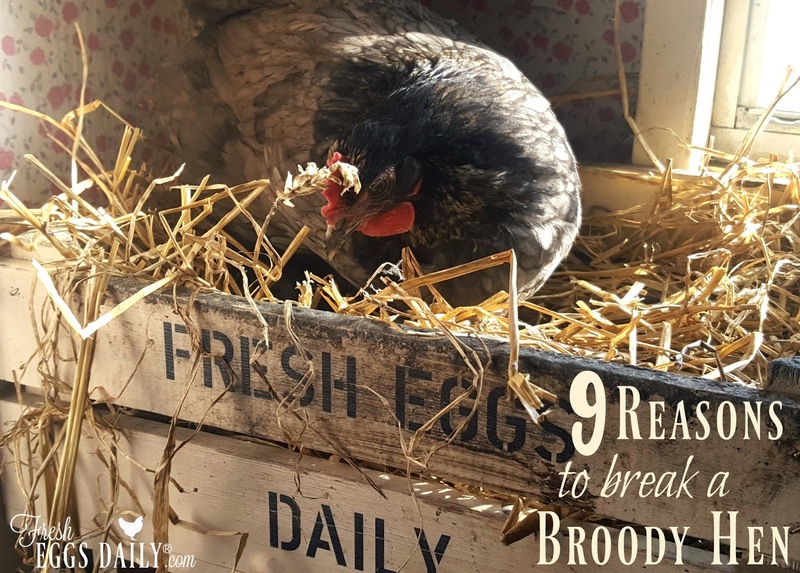 Just be aware that sometimes moving your broody can cause her to stop sitting, so often moving her at night, and moving as much of her nest as you can along with the eggs, can prevent her from walking away. A broody hen will hog the nesting box and not allow other hens to lay their eggs in 'her' box. Since chickens usually all want to use the same box, having a broody sitting in the box all day can lead to squabbling, jockeying for position and broken eggs if other hens do manage to lay their eggs in the box. 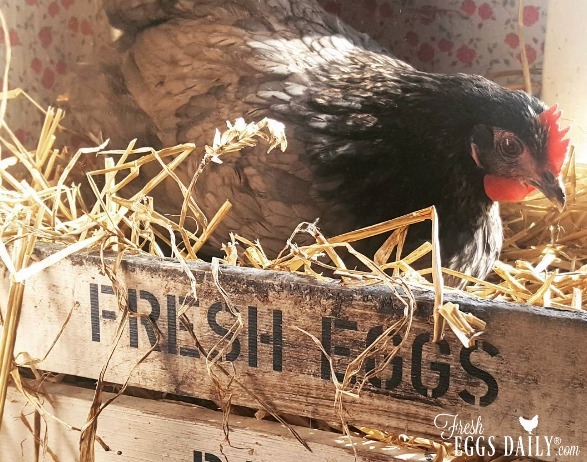 Fresh Tip: If you have a broody sitting on fertile eggs, to avoid breakage or other hens laying their eggs in the box, it's a good idea to either block off the box from the other hens or move the broody and her eggs to a separate area of the coop. A broody who sits in a nesting box day after day effectively has removed herself from the flock, so she will often have to be reintegrated slowly - just like a brand new flock member would. I've even seen broodies who have only been sitting for a day or so be pecked and harassed by other flock members when they emerge to get something to eat or drink. Fresh Tip: By leaving your broody inside the coop, she has a better chance of remaining part of the flock even if she is sitting for the duration. Once the chicks have hatched, setting up mom and babies in a cage on the coop floor will ensure that they all are considered flock members, which should lead to a seamless integration. So there you have it. Nine good reasons to break a broody if she's not actively sitting on fertile, viable eggs. She should be out 'being a chicken' if she's not going to be a Mom! As long as she's sitting on eggs that you anticipate hatching, your broody hen should be fine for the three week incubation period, but it's still a good idea to keep a close eye on her as far as her appearance and health goes. It's also not recommended to let a hen go broody more than once a year - to let her body recover from the ordeal.